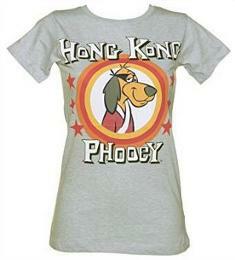 On this page we're going to jog your memory with some 80s cartoon T-shirt ideas. Of course, you probably won't have watched every cartoon featured here, but I hope you will find at least one or two that you will have enjoyed watching back in the day. Why not celebrate your childhood with one of these retro T-shirts? Simplyeighties.com is a participant in the Amazon.co.uk Services LLC Associates affiliates program. This is designed to provide a means for websites like ours to earn fees by advertising and linking to their products. If you grew-up during the 70s, then you will certainly remember this loveable cloth cat. There were only ever 13 episodes, but this series is many people's favourite from their childhood. Characters included a little girl named Emily, a rag doll called Madeleine, Professor Yaffle the wooden woodpecker bookend. Oh, and I must not forget the mice who did a lot of heaving! This unusual cartoon was aired in the 1970s and featured a family of shape-shifting, blob creatures with no legs. They were thoughtful of the environment and tried to educate kids to be environmentally aware. There are a couple of top quality T-shirt designs available which are both available in many colours and sizes for both Men and Women. The other design is featured below. There were just 13 episodes of Bod (each one started with the announcement "here comes bod") which was originally shown in 1975 on BBC TV. The cartoon was repeated until 1984 and featured the voices of Dad's Army's John Le Mesurier, and Kids TV presenters Derek Griffiths and Maggie Henderson. Just about everyone in the UK has heard of Button Moon - even if they didn't watch it. This series of ten minute animations was shown on ITV between 1980 and 1988. Interestingly, the theme tune was composed by Peter Davison (Doctor Who) and his actress wife Sandra Dickinson - they are now separated. Remember this prehistoric superhero? Perhaps, one of the best-remembered features was his battle cry where he called out his own name. Captain Caveman and The Teen Angels was aired from the late 70s and into the 80s and was created by Hanna-Barbera. These two cheeky chipmunk characters were created in 1943 by Disney. In 1989 a new series called Chip 'n Dale Rescue Rangerswas produced and this ran for three seasons. 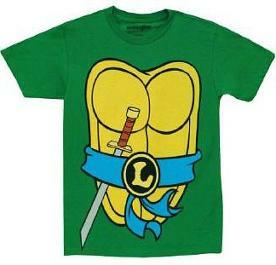 If you're looking for a cartoon tee that not many others will have thought of, then this is ideal. This popular 1970s stop motion animation took place in Wheelie World, where happiness dragon called Chorlton spreads happiness everywhere he goes. Sadly, Fenella Fellorick, an evil kettle witch had other ideas, and was forever trying to spread misery across the land. The only supplier I could find selling T-shirts was Redbubble who have a couple of designs. No T-shirts currently available - sorry! This horrifying British cartoon series was a spin-off from Danger Mouse and ran for four series, starting in the Autumn of 1988. Count Duckula lived in a Dracula style, scary-looking castle with Igor the butler and his over-sized nanny. This was a very British 80s cartoon that featured the voices of comedy greats David Jason (as Danger Mouse) and Terry Scott (as his sidekick Penfold). There will, no doubt, be many of you who have fond memories of coming from school and settling down in front of the TV to watch this cartoon - that includes myself! We all remember this wicked duo don't we? Muttley's evil snickering is still firmly fixed in my head! The duo appeared in Wacky Races and also had their own cartoon series which has been reinvented and repeated several times. There are around a dozen T-shirt designs available featuring the classic 80s puppet TV series by Muppets creator Jim Henson, which originally aired between 1983 and 1987. This is a quirky choice of T-shirt for an 80s festival, party etc. I adored this fun 70s cartoon as a kid, which featured Penry, the mild-mannered janitor who would transform himself into the clumsy kung-fu superhero by running into a filing cabinet - after his cat, Spot, had freed him that is! This was a very British and old-fashioned animation which featured a lovable steam engine called Ivor. There are a number of designs available and in various colours. 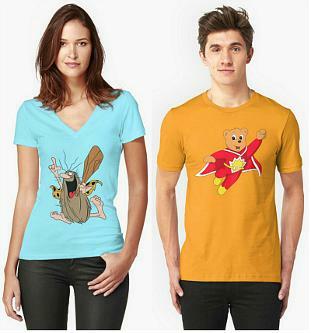 These tees would make a lovely gift idea for someone who grew up watching the animated series back in the 1970s. Transport yourself back to Cuckoo Land with one of these retro cartoon T-shirts. Although regarded as an 80s cartoon, the series originally aired on ITV from 1976 to 1979, but was repeated during the 80s. Best memories for me are Jamie's pet dog Wordsworth and his mother saying "sleep well, Jamie" at the start of each episode. M.A.S.K. (Mobile Armoured Strike Kommand) was an action-packed cartoon series that originally aired for two season from 1985 to 1986, with 75 episodes in total. The storylines revolved around a law enforcement task force taking on a criminal organistation called V.E.N.O.M. 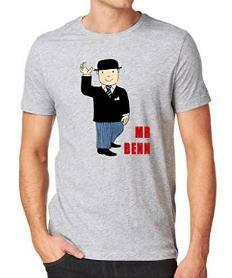 This cartoon was one of my favourites from my childhood, and I always used to get excited about what character Mr Benn was going to transform himself into in the fancy dress shop. There were only ever 13 episodes, but one extra episode was shown in 2005 entitled Gladiator. This hilarious, short-sighted character was first created way back in 1949 for a cartoon called The Ragtime Bear. Many cartoons were shown throughout the 50s and 60s and repeated through the 1970s. 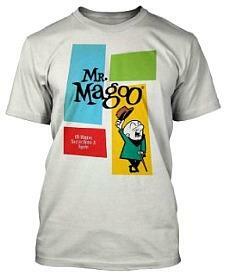 A new series which aired in the late 70s was entitled What's New Mr Magoo? Arthur Lowe was the perfect choice for narrating the original Mr. Men cartoon series, and the wide array of characters was fascinating to young children, including myself! There are many tees available and our favourite is this amusing "Bend it like Bump" design. I adored this wibbly wobbly style cartoon which was first shown back in the 70s. It used to be shown on a weekday tea-time just before the news, and was narrated by the late, great Richard Briers. However, Custard (the pink cat) was one of those annoying characters that would make my blood boil! This retro Hanna Barbera cartoon featured the goofy character Scooby-Doo with his gang driving around in the mystery machine van to solve, erm, mysteries! An incredible 4385 episodes of the American kid's puppet show produced and is still going strong! You may remember Oscar the grouch who lived in a trash can and was actually orange in the first season before turning green! This was a Welsh 80s cartoon (very different to the more gentile Ivor The Engine, though) that originally ran from 1983 until 1985 on S4C and then BBC1. The animated series followed the adventures of a superhero teddy bear and his bumbling friend Spotty. This very well-known 80s cartoon series followed four anthropomorphic turtles (Yeah, I've never heard that word before either, but basically they had human traits) who shouted out "Cowabunga!" quite a lot. Can uyou remember their names, though? They were Donatello, Leonardo, Michelangelo and Raphael. The pink knitted aliens are now back on our screens (albeit in a more modern form) but the original animations will still remain No.1 for a certain generation. There are numerous tees celebrating the classic series. Now, I just adored the muppets! Created by Jim Henson, the comedy puppet series originally ran for five series (12 episodes) on ITV from 1976 until 1981. Kermit the Frog features on this retro T-shirt shown here. 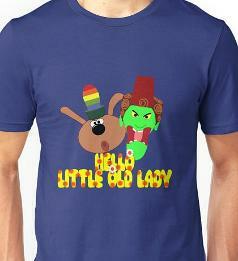 However, there are oodles of other T-shirts available featuring the muppet characters. Who's old enough to remember collecting Smurf figures at their local National petrol forecourt? I managed to collect about a dozen smurfs, and Papa smurf was my favourite character. The blue, gnome-like creatures became so popular they topped the music charts in 16 countries with "The Smurf Song". Okay, so this wasn't actually a cartoon, but an animated series featuring clay models. Each story followed the adventures of a group of monsters who lived in a castle. 40 episodes were created and each one lasted for five minutes. You may also remember the voices for the characters which were provided by Willie Rushton, and it just wouldn't have been the same without him! The Trap Door is now considered a cult classic. So, what were Thundercats exactly? I can only describe them as part human, part cat aliens. Originally a Japanese animation, the cartoon was adapted for an American audience and originally aired from 1985 to 1989. A comic book by Marvel was also produced. This classic cartoon was a firm favourite in our household, and the duo's slapstick antics used to have us all in stitches. The cat and mouse first appeared in the 1940s and was originally created by Hanna-Barbera for MGM. In the 60s another series of cartoons was created by Chuck Jones, although, personally, I much preferred the originals which were regularly repeated on TV during the 70s and 80s. I must've spent a lot of time watching cartoons as a child because here is yet another firm favourite. The most effectual Top Cat was the leader of a gang of alley cats who were always up to no good and trying to outwit Officer Dibble. This funny Hanna-Barbera cartoon was created in the 1960s but the 30 episodes were regularly repeated. There are actually dozens of designs available with a Transformers theme, and the one shown is a cybertron contrast design. The first toys started to appear around 1984 with the TV series and movie quickly following. TV ads for the transformer toys (I can still remember the "robots in disguise" song in the ad) were regularly shown during the 1980s. "Um Bongo, Um Bongo, they drink it in the Congo!" Yes, if you're of a certain age then you will remember the Um Bongo TV adverts that were a regular feature on our TV screens back in the 1980s. Two tees are availabale featuring the classic logo.